There is always a magical dry fly fishing spot that you need to keep between friends. An unlikely looking stretch of water that you only learn about after the friend that knows about it swears you to secrecy. 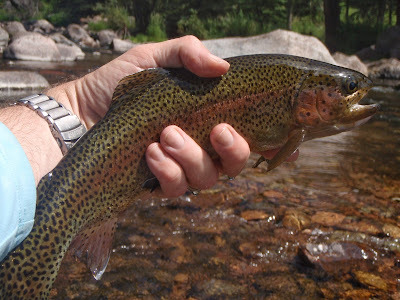 It's the type of place that big trout chase small BWO's in skinny, gin clear water. We fished this river for a couple of hours, and we each caught some big trout. The water was small, and we fished several pockets together, each taking turns with our fly of choice. One of my most enjoyable memories from this river was when JT called me over to fish for a nice big trout he spotted that was rising to small BWO's. The water was very clear, and I had to lay the fly down very carefully in a small window. I loaded the Scott S4, cast the line, mended quickly, then an explosive take...Fish on! Seems like everybody has a River X...and they won't tell me where it is. I guess I wouldn't blame you Mike, that's a beauty. I'll tell you about it in person some time!